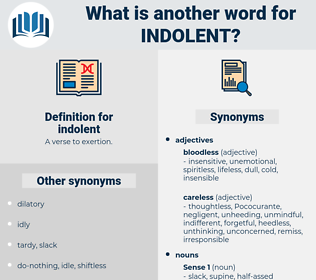 What is another word for indolent? attentive, prudent, mindful, ready, thoughtful, concerned, cautious, accurate, careful, painstaking. smart, intelligent, witty, keen, sharp. 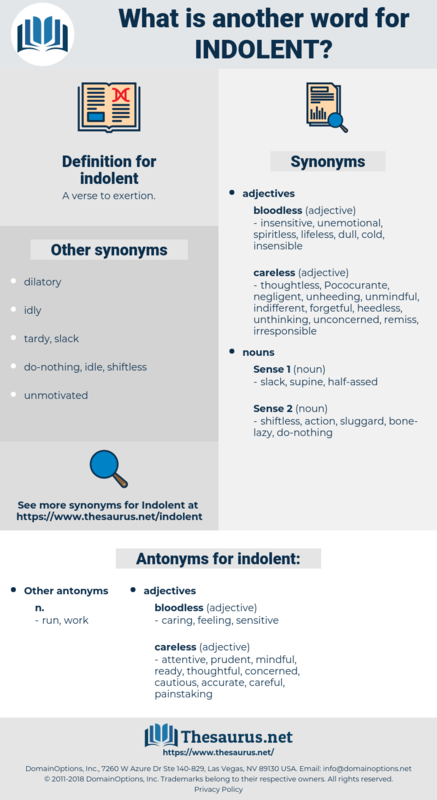 critical, upset, nervous, worried, hyped, intolerant, hurried, agitated, demanding, strict. industrious, intent, diligent, active, hard-working, busy, enthusiastic, energetic. exuberant, occupied, zealous, frisky, employed, enterprising. He laughed softly, in the quiet, indolent fashion that would have been pleasant if it had not been at her. I always looked upon you as a somewhat indolent person.